Another perfect full-day trip from Barcelona is the sea resort town of Sitges. A half hour train ride from Plaza Catalunya gets you there, and the trains run from 6 A.M. to midnight. 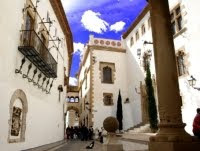 Wedged beautifully between the hills and the sea Sitges has an impressive artistic and cultural heritage. Luckily Sitges escaped the overzealous development that has decimated fate of so much of the Mediterranean coast. There is nothing tacky or cheap about Sitges.In fact property in “The St. Tropaz of Spain” is as pricy as any city in Europe. But what do you care; you’re only going for a day. Sitges’s charm is its architecture. Many Catalans went to the Americas to make their fortunes. Many returned in the late 19 century with lots of money and commissioned large mansions in the place to be, Sitges, and in the latest fashion, the art nouveau (modernist) movement of Gaudi and others. Many of these intriguing mansions can be found on the “Carrer Illa de Cuba” (The Island of Cuba Street). Guess where these Catalans made their fortune .Well, not the United States. And Sitges has always been a center for artists going all the way back to when Catalan impressionist painter Santiago Rusiñol took up residence there. Of course summer means beaches and Sitges has them for all tastes. If you go in for international crowds and jet-set celebrities, check out the main beach “de la Ribera. See and be seen! If more intimate beaches are more your style search among the small rocky bays and coves. Try Sant Sebastian beach, for example. There is even a nudist beach, permitted but not required. After a day at the beach Sitges comes alive. After dark the weather cools down, the discos, pubs, and clubs heat up. You can put in some after-dark time at the “Carrer del pecat” (“The Street of Sin”) and still catch the midnight train back to the hotel. Next week (25 August 21-25), their "Festa Major " is the show. 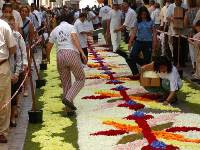 Don't miss all the dance, music and shows of this typical fiesta. Because of Sitges’s artistic tradition and its sheer beauty many festivals and street parties make their home here. The most famous one is The International Film Festival. Last year it celebrated its 40 th anniversary. It started out dedicated to science fiction, horror, and fantasy flicks and keeps a lot of this tone and attracts film celebrities year after year. It is coming up from October 2 to 12. 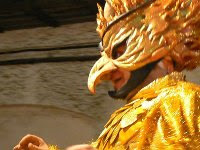 And Sitges celebrates Carnival. It’s not Rio, but it is one of Europe’s most famous. It has the usual fancy costumes, parades, and enthusiastic party goers. 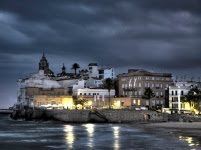 It is an especial favourite of the gay community who are one of the many groups who choose Sitges for good times. Sitges was SO much fun! It's easy to get to, and the train ride is brief. And the best part: the water is clean and warm! Aerobus A2: Take the A2 blue bus from the airport to Plaça Catalunya. There, take the metro (green line) until Liceu stop. Train (Renfe): Take the train (Renfe) from the Airport station (located between terminals 2A and 2B) until Passeig de Gràcia station (about 40 minutes). There, take the metro (green line) to Liceu stop. Aerobus A1: Take the A1 blue bus from the airport to Plaça Catalunya. There, take the metro (green line) to Liceu stop. Train (Renfe): Use the shuttle airport service ("Lanzadera") until the terminal 2A or 2B, the train station is between both. The transfer will take about 10 minutes. Take the train (Renfe) from the Airport station (located between terminal 2A and 2B) until Passeig de Gràcia station (about 40 minutes). There, take the metro (green line) to Liceu stop.